This spring, Easter Sunday does not fall until April 21st which is rather marvellous as it makes good weather for our Easter Egg hunt rather more likely, thus encouraging as many entrants as possible. As a child, I use to amuse myself in church by puzzling over the tables in the Morning Prayer book which showed how to calculate the date for Easter each year. My mother always ensured we arrived far too early for church, so there was always a certain amount of sitting and waiting and the oddest thing is that I find I do exactly the same today and again re-read the same books. The timing of Easter is all to do with the moon. In Christian Church calendars, the spring equinox was determined to be fixed on March 21st. Easter was deemed to be the first Sunday after the first full moon, called the Paschal Full Moon, and so may fall therefore on any date between March 22nd and April 25th. In 2019, the first full moon does not occur until April 19th; hence Easter is so late this year. The Moon repeats the dates of its phases approximately every 19 years (the Metonic cycle), and the so called “Golden Number” represents which year you have reached in that cycle. Then, if you are trying to plan ahead, the year of the cycle can then be used to determine the date of Easter in any given year. It all sounds a bit like a school maths paper but, to work out the “Golden Number”, add 1 to any given year and divide the result by 19. Calculate to the nearest whole number and the remainder is the “Golden Number”. If there is no remainder, the “Golden Number” is 19. So using 2019 as an example, take 2019 and add 1, which is thus 2020. Divide it evenly by 19, which gives a remainder of 6. Therefore, the “Golden Number” for 2019 is 6, meaning 2019 is the 6th year of the current Metonic cycle. However, these days, apart from church services and an eternal acknowledgment of what others have done for us, Easter has other traditions as well such as chocolate (lots of it), Easter egg hunts and the Easter bunny. At Highclere, for the last ten or twelve years we have created a charity Easter “trail” through the gardens which takes place on Easter Day. 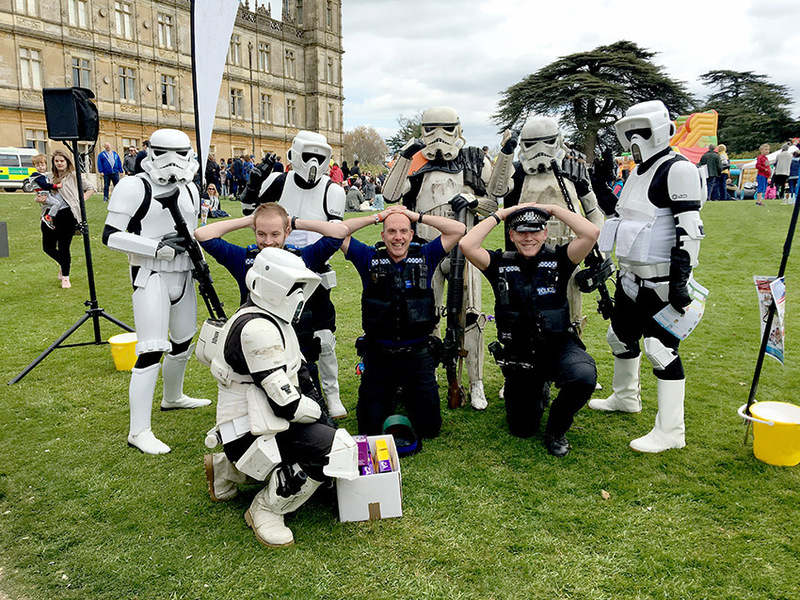 This year it is in aid of the Murray Parish trust which raises money to support paediatric emergency medicine, ensuring children affected by major trauma receive the best chance of surviving and recovering. Jim Murray and Sarah Parish are an extraordinary couple, generous in life and in turning round their own loss to help contribute to saving other children. It has been an honour to plan and curate a day to help children like their Ella-Jayne. 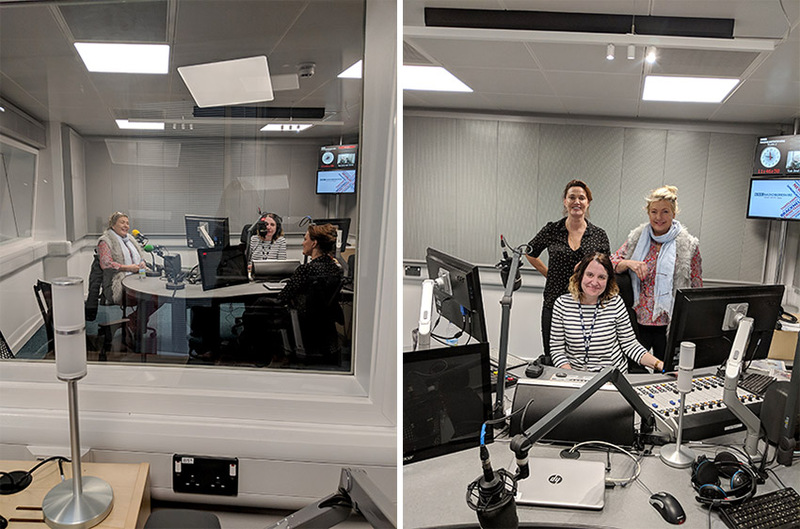 Last week, Sarah and I went to Radio Berkshire to broadcast the event with presenter, Sarah Walker as well as have a chat about all Sarah’s upcoming television roles. 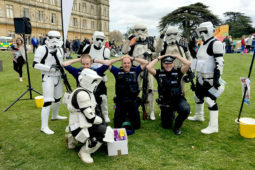 I was just starting to feel a little panicked about the Easter Eggs, one of which we give out to every child arriving back from the trail when we heard that we have been offered over 1,000 Easter eggs by a delicious chocolate supplier – the Meaningful Chocolate Company. It is unbelievably kind of them and so we are hoping that at least this number of children will join us on Easter Day with their parents and families. In addition, we welcome as many children as are willing to take part in our Easter Bonnet parade – which is utterly invidious to judge. We hope that they will also enjoy the bouncy castle and other games on the lawns, weather permitting. I hope it will be a fun day and give much pleasure to the families who come, as well as helping Jim and Sarah’s cause. We may have lost touch with the cycles of the moon, forgetting sometimes to look up and out but, when my son Edward was little, he and I we would read a book about loving each other to the moon and back. There really is nothing more important and today Ella-Jayne and her memory remain loved in just such a way. LOVELY FEASTS. HAPPY NEW WEEK FOR YOU. Thanks for this interesting blog – from holy instances, the wonders of the moon and religion, to Easter bonnets and mouth-watering chocolate. I’m reminded of new Easter childhood dresses, gloves, bonnets and corsages. Lovely memories thanks to you! Will be visiting your home tomorrow (with Viking). So excited! Easter at the Castle, that must be so wonderful. Highclere seems to be a pillar for so many amazing things. Bless you Lady Canarvon. I loved being at Highclere with Viking this past year. It was a treat to visit with you personally and it is stored in my memory bank. Good memories all. The wonder of life and resurrection is inspirational. Thank you. The photograph of the castle with the moon is stunning! I’m positive that your friends, family and staff all LOVE YOU TO THE MOON AND BACK! Greetings from Fort Worth, Texas! Easter brings back memories from childhood, in which Mother would dress me in a stiffly starched and frilly dress, my shoes were white patent leather, pinching my toes. And the ever present lace trimmed white socks that would slip off my heels and bury themselves at the bottom of my shoes. I didn’t like the dresses because they were scratchy and my petticoat was starched, too. At church, the sermon always was long, so the ladies would begin looking at their watches, not wanting their hams or beef roast to burn in their oven at home. Everybody’s stomach would begin grumbling, so Mother would hand me some hard candy, which would also keep me from squirming around. I had to continue wearing that stiff and scratchy dress for our Easter meal, and for interminable photographs. It was such a relief when I was finally allowed to change into my grubbies, search for Easter eggs, and climb a few trees. It’s a beautiful memory now, and I now have the honor of hiding eggs for my four grandsons, and drinking in the looks of pure joy on their little faces. Their giggles and laughter make me young again. LINDA FAYE, you have described my childhood Easter’s perfectly too. Love your description!! to the point exactly!!!! This spring is still cool but we’re seeing a good bit of sun – hope you get a beautiful day for your trail walk. You write so well so I looked up the word invidious. – what a surprise ! But l’m sure very accurate for the occasion. Lots of envy resentment and jockeying for the prize. Happy colored eggs and lovely bonnets. Thank you Shirley for the Eater Greetings you sent to us all. The same felicitations and best wishes are sent to you. I also note your comments regarding the word, “invidious”. I am still coming to grips with the word, “verisimilitude” from last week’s blog. A wonderful choice of words from an author with an extensive vocabulary. I totally agree with your praise Shirley and take the liberty to add that Lady Carnarvon is a skilled “word-smith”. Her blogs, articles and books are all an absolute pleasure to read. Thank you for revealing the manner of calculating the Golden Number for the Metonic Code/Cycle. I was unaware of it. Do you know if the Golden Number and the. Metonic Cycle (or a version thereof) are applied in calculating Orthodox Easter? On a completely different topic. I have read that May promises to be an interesting month. In particular I note that the 2nd May will mark the 200th Anniversary of the birth of Queen Victoria. A little birdie also has told me that a most entertaining person will be interviewed in a popular English magazine with a worldwide distribution. I even read a reference to you being referred to as the chatelaine of Highclere. A title that I think fits you very well: Firstly, you are certainly the wife of a gentleman who owns a somewhat large chateau. I also now have renewed my subscription to “Britain Magazine” and eagerly await receipt of the May edition. I am indeed a Chatelaine – in every sense of the word. Although we may need new nomenclature considering that we have so many padlocks, digital locks and alarm codes too! Correction (of my error): The 200th Anniversary Of Queen Victoria’s birth falls on 24th May 2019. My apologies for the earlier error. Jeffrey, while it is true that the Orthodox still follow the Julian calendar, the calculation for Easter is slightly different in that it must be after Passover. I’m not familiar with the metanonic calculation so no idea if it applies to Orthodox Christians. Note also that there are 22 sui juris Eastern Catholic churches that follow the Gregorian calendar as we’re in communion with Rome. What a wonderful trip you have planned for all of your celebrations! I hope the British weather is kind to you and you enjoy your visit. Such an entertaining and educational posting. I know the book you read to your son so very well. It was the bedtime book for that generation of children. My sons benefited from my college textbooks; it’s amazing what infiltrated their consciousnesses when they were toddlers. Well-done with the Highclere activities- establishing such an activity center for a global audience is remarkable. I commend you & your team. Now, I’m back to hurricane recovery in my home. I’m celebrating a roof that withstands rain and restored pantries! Have a wonderful week. Best of luck with your work, is it hurricane season already? I love it: I used to ponder those same tables during a ‘long’ sermon. Thank you for that memory and a smile. Good luck with the Egg Hunt – warm, sunny weeather! I so-o-o- wish you were our neighbor!!!! Best of luck with your Easter Egg hunt Lady Carnarvon. Such a worthy cause helping children. I always loved shopping for my Easter dress and shoes with my Mom and sister each year. I loved your explanation of how Easter is calculated each year. Here in South Louisiana, being Catholic the Easter/Lenton season starts on Ash Wednesday and so Mardi Gras or Fat Tuesday is our last day to indulge in all things decadent until Easter Sunday. I wish you a very Happy Easter and a blessed Easter season. Thank you – I am sure it will be a wonderful day for all. 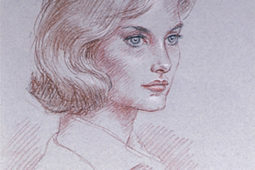 Having been born in 1940, Easter fell upon the latest possible date, April 25th, my 3rd birthday. I will need to live another 20 years, to age 98, to enjoy such festivities again. In the meantime I do vicariously enjoy your Easter events and posts. Every ray of sunshine on April 21, 2019! Thank you – sunshine would be wonderful, but we will settle for no rain! I can’t begin to describe how much I look forward to my emails from your site. As America has seemingly gone completely mental–your posts are a nice refresher from all that mess on the news (other than the fact we all anxiously await the birth of the Duke and Dutchess baby!). Thank you again for the wonderful work you do and for the pictures and all the things you fill your readers in on at Highclere! Delightful! As a child I loved Easter egg hunts! Such an important part of the Easter Day celebration. Thank you for the comment on Christ and the suffering He endured for us. That is where it all started. I appreciate your boldness. I live in Florida, so we know the hurricane season all too well. It officially begins here on June 1. It goes until December 1. But there have been years when a storm forms earlier. We have experienced the damage from hurricanes as well. We lost all the contents of our home in 2005. Quite an experience. I wanted to thank you for this weeks blog! I have always wondered how the date for Easter is determined. I am amazed that the prayer books in the UK had that information. I also remember setting for what seemed like HOURS in Church, trying to keep still and quiet. Your recollection made me smile…now I love to go to church. It is especially meaningful at Easter. I know the term EASTER is from a pagan ritual. But to me, Easter is about the resurrection of our saviour. The very best gift of all. 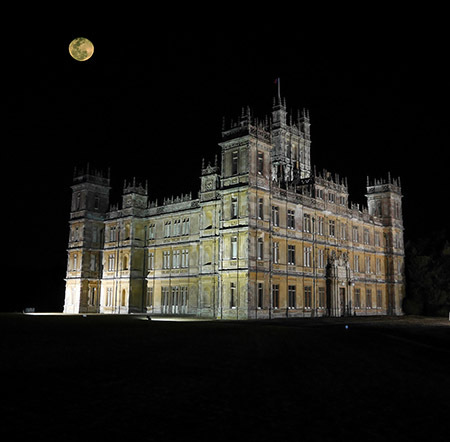 Maybe some year I can be present at Highclere for the Easter Egg Hunt. What wonderful fun that would be. The little ones all dressed in their finest and the Bonnets! That is ‘right up my alley’! God Bless you, Lady Carnarvon. You make the world a better place. You must come – we would love you to join in our Easter celebrations. 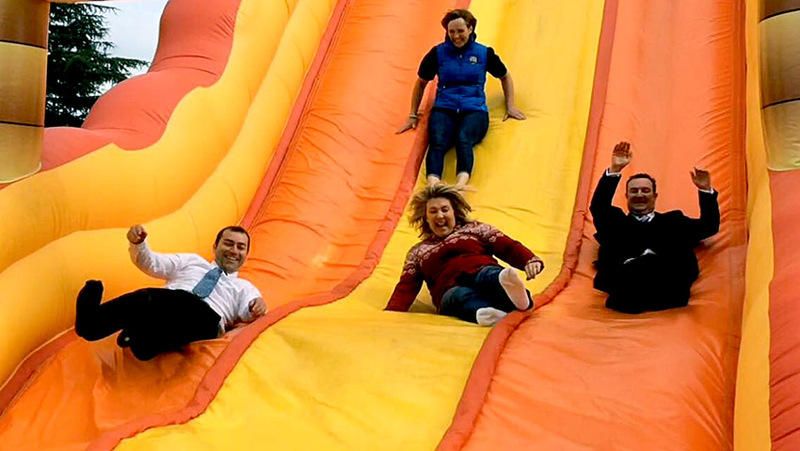 I forgot to mention how much I laughed at the photo of you and your staff sliding down the bouncy house! You gave me a great start the week! Thank you for that. This is why we all love you! Thank you, thank you! I have never known how to calculate when Easter comes! Great info!!!! Thank you too, for sharing the reason we celebrate that glorious day! With His resurrection He gave us the promise of eternal life with Him in beautiful heaven for Christians. May this Easter be one you will never forget. Fill ed with joy a d happy memories for you and ALL of Highclere! 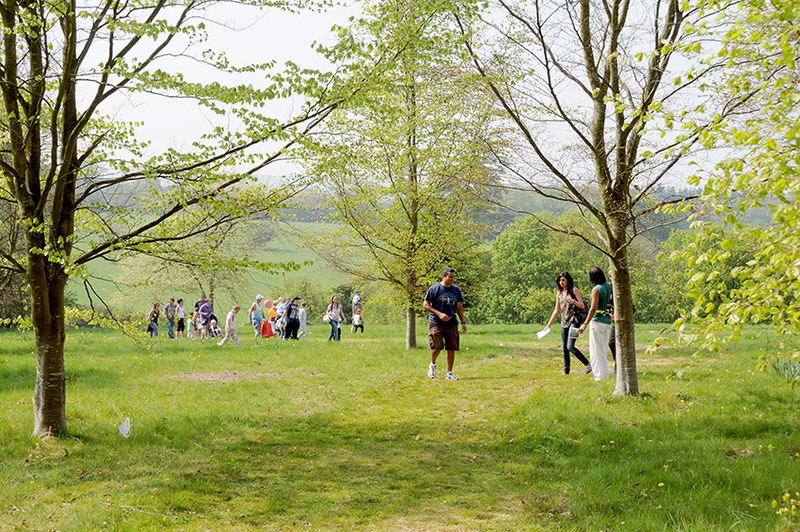 Thank you for reminding us the why we celebrate Easter, the when and the how it is celebrated at Highclere. I am sure your Easter will be a very joyous celebration as you host those lucky “neighborhood” children. Bless you. Easter for me is always extra special as my birthday falls around the same time. This year, with Easter being so late, the birthday celebrations have been extended. The big day is actually today (and it is big, my 50th!) and the best present of all is a visit to your beautiful castle next week, very excited!! How wonderful – I really hope you enjoy your visit. We always love to read your blog. It’s so interesting. It is even more special now that we visited last month. We so much enjoyed your beautiful and amazing home. It was an extra honour to be able to talk to you too. One question we forgot to ask you, is Highclere in Hampshire or Berkshire, as articles on the internet differ? Have a lovely Easter and hope all goes well with the Easter fundraiser! Thanks so much for showing us your lovely home! Thank you and Highclere is in Hampshire! My reaction has nothing to do with your Easter events witch Will be great again I hope,but I would like to know if You are organisating another first war Remembrance day. Is so,we really would like to come over and be part of this happening. Anna from the Netherlands and sorry for My pour English. You are sooooo much fun!!! Love todays blog – a real pick me up!!! See you soon – I know the weather will be great by the time August rolls around!!! We were recently in London, and at Highclere, for Mother’s Day. Both incredible experiences! It was so nice to meet you – an unexpected treat. We noticed all the chocolate eggs in the shops, some rather large and filled with more chocolate treats. This is not a tradition in the United States. We often give and receive chocolate bunnies and jelly beans. Do you know the history of the large chocolate eggs on Easter? Is this common in the rest of the UK? Thanks much! Since ancient times, the egg has been a symbol of fertility, new beginning and rebirth. As Christianity spread throughout Europe it incorporated many pagan beliefs and customs. As a symbol of new life, over time the egg came to represent the emergence from the tomb and the resurrection of Christ. 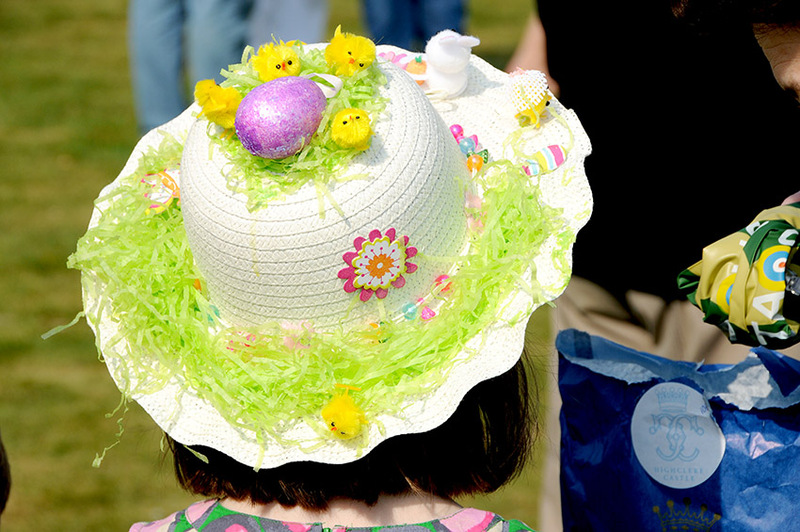 Decorating eggs is a custom that predates Christian custom. The first chocolate egg in the UK was created in 1873 and we have loved giving and receiving them every since. Appreciate your posts! So fun to read! Thank you for taking the time. 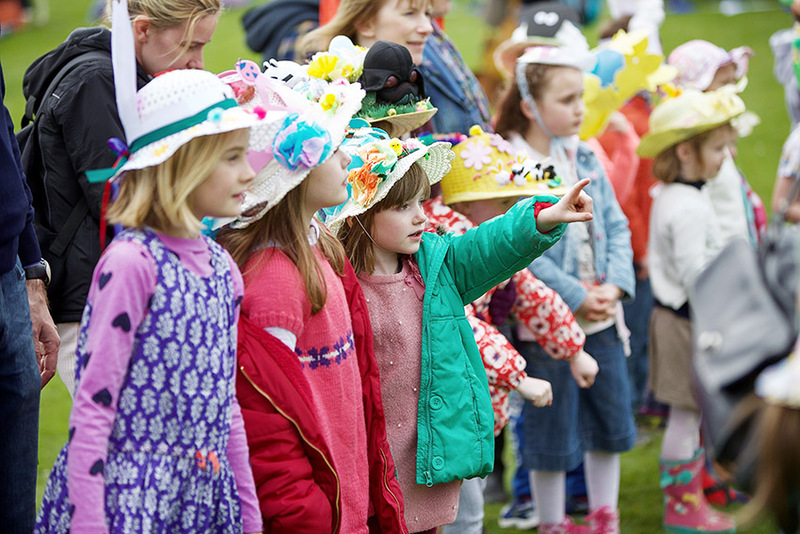 Oh, to be a kid again and come to Highclere for the Easter Egg Hunt! This was a fascinating article about the determination of Easter Sunday’s actual date. I do wish the Presbyterians had one of those tables in a prayer book – I spent all my time doodling on the morning bulletin, much to my mother’s chagrin. The tables sound quite intriguing – thanks for sharing with us! I always the wonderful little nuggets of history you find. And do have a wonderful Easter…and a successful event! Being early for church was very good training at sitting still and keeping quiet – something I don’t seem to do so well these days! Have a wonderful time! Wishing I could be there too! How lovely! May it be a most sunny and dry day for the Easter Egg Hunt and other evenst, and how nice to sponsor a charity, too. all in the fine spirit of Easter and Spring at beautiful Highclere! We will celebrate a week later, Greek Easter is Orthodox Easter on Sunday, April 28. It is all to do with the full moon, but a Sunday AFTER the Passover, too. Often “Western”Easter is celebrated just as we begin Passion Week, it upsets the greeting cards to and from my family and friends in the States. Sometimes, rarely, we do hit Easter on the same Sunday, it happened last in 2017 and will happen again in 2025, 2028, 2031 and 2034, if we’re still around then? Oddly enough, when in 2004 we had the same Easter Sunday on April 11, then the following year, 2005, we had the “most distant” with Western Eastern on March 27th (very, very early)and Eastern Orthodox Easter on May 1st (also another big holiday here! )…go figure? What a wonderful charity cause. Ah Easter egg hunt… it is not a French Canadian tradition but I wish it did!!! Morevoer, I don’t have any children to establish it either. Part of my family who has Irish blood do have one each year for the children and I wish I had knew that when I was a child, I would have insisted to be a part of it!! I’ve just (very late to the party) watched your episode of Mary Berry’s Country House Secrets and was excited to enjoy a bit of your house with you. Watching the episode, I thought you were so knowledgeable, witty, and down to earth. I found myself picking up my iPad while watching, just hoping you also shared your experiences on social media or a blog. I am so pleased to have found it, so hello from Michigan in the US! You are too kind. It was a great pleasure to welcome Mary and the team to Highclere. She is a truly remarkable person. Welcome to my blog! Always enjoy your blog! 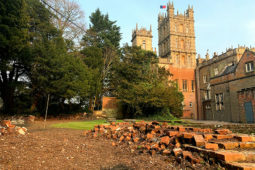 Hope to see you when we tour Highclere this Sunday April 14th. Thank you so much for your thoughtful blog. I have wondered about the timing of Easter and your explanation is very clear. I recall reading another version that had me doing loops trying to follow their logic. I am new to your blog, thank you. Thank you for reading it – I do hope you enjoy my ramblings. How lovely to meet you all and Sarah is a star.. I have read and reread this entry several times. Fascinating! And strange I never knew how to calculate the date when Easter falls based on moon cycles… or perhaps I didn’t pay attention as I should have when it was taught. Thank you, Lady Carnarvon, for your beautiful Easter message, reminding us of the real reason why we celebrate Easter, the resurrection of our Savior, Jesus Christ. May God bless you and your family, as you prepare wonderful experiences for your visitors this year. At this time, I can only “visit” Highclere from here in Michigan, through your blogs and your books. Hopefully, some day in the future I will be able to join you in person. I attended your Easter for the first time with my children as we’ve not been able to do much over Easter as we’re normally in hospital with my oldest son. We really enjoyed ourself and highly recommend the event to everyone. Such a beautiful grounds, well organised. Thank you all so much. Hopefully see you again next year for the Easter egg hunt.